The ALC-PRM-VFC photocell will turn lighting on when the ambient light falls below a preset level. The lighting will then be turned off when the total light level rises above a separate preset level. A adjustable time delay prevents nuisance switching (e.g. dark clouds). 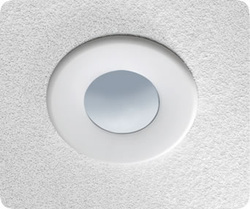 The ALC-PRM-VFC can be mounted flush or surface on a ceiling.